Mika Brattain will look to make a strong impression in what will be his first U.S. Junior Closed Championship. Though the 16-year-old Lexington, MA native should be well-prepared for the level of competition he will be facing in this year’s tournament. A participant in the 2014 U.S. Cadet Championship and the winner of the 2014 83rd Massachusetts Open, Mika can already claim success in high level chess play. In last year’s MA Open, Mika had to earn his state champion title by beating the two former champions, GM Alexander Ivanov and Robert Perez, in consecutive rounds. Clearly, Mika is a player who does not shrink when facing strong competition. Mika found pleasure in chess early, learning how the pieces move at 6 years old, and at 10 seizing victory at the 2009 K-5 Chess Super National Championship, winning him a college scholarship. 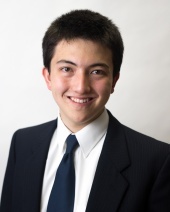 Mika credits his rapid development on his practice and study at the Metrowest and Boylston chess clubs, as well as the support of his father, Michael. In the near future, Mika looks to collect IM norms and to push his rating above the 2500 threshold. A year ago, one of Mika’s goals was simply to qualify for the U.S. Junior Closed. Now that he is in the tournament, we can assume he wants even more.